An extended Riviera Nayarit travel venture from Punta Mita to San Blas took us off the beaten trail and was more than we could have ever imagined. Flo and I followed a loosely plotted journey by jeep along coastal Highway 200, onto secondary paved roads and over many dirt byways. There were days that called for finding alternative, circuitous routes on jungle pathways or by water to reach intended isolated destinations. Our search for secluded beaches, out-of-the-way villages, street markets, and waterfront ocean towns was a cathartic, peaceful and joyous time of discovery. The trip was not without frustration. Attempts to find unspoiled beaches were seldom easy and more often difficult. Locating small towns where access roads had once been and are now unmarked or otherwise indistinguishable was time-consuming. Traveling the rough roads through sparsely populated settlements was often the beginning of a long, hot, winding trek amid close growing vegetation, fields of crops and pastures of cattle that eventually dead-ended at an impassable, barricaded gate. We were greeted by guards who courteously denied our access to the beach. Fortunately, we were able to convince them otherwise at a few locations and gain passage despite their initial objections. The heavy-duty, 4-door, 4WD vehicle selected for the journey, on board beach chairs, umbrella, boogie boards, soft cooler filled with provisions, and machete repeatedly proved to be essential assets. When access to a beach was denied, overland GPS jungle routes led us on alternate courses to destinations. When our charm, persuasion and jungle trails were unsuccessful, hiring a captain and canopy-covered small boat (panga) in a nearby seaside village took us to places inaccessible by land. Roadblocks inspired creative solutions that resulted in being alone together on exquisite beaches almost every day. Some beaches were small and surrounded by rocky coves, others occupied wide swaths of sand to the water’s edge, while a few extended as far as the eye could see. All provided magnificent wildlife, blue skies, sandy shoreline, breaking ocean waves and bright sun that made for relaxing and pleasurable times. Previous travels in the region had provided many inspirational experiences, left indelible memories and brought us back for further exploration. This time we discovered more places to stay and dine, rich natural habitats to explore, and many interesting people, places and lifestyles. An initial stay at the St. Regis Punta Mita Resort immediately facilitated our acclimatization to the heat, humidity, cuisine and tempo of the latitude while serving as a reminder of why we enjoy this enchanting hideaway. After our road odyssey, we returned to St. Regis for the Punta Mita Gourmet & Golf Classic. There is no doubt that Riviera Nayarit is changing. Although pockets of development between Punta Mita and San Blas have popped up in recent years, accessibility to undeveloped pristine beaches and authentic settlements had still been possible. Fonatur, Mexico’s national trust for the promotion of tourism, has been pursuing development of prime coastal real estate and tourist destinations while actively attracting private investors since 2000. The government led initiative to create new towns, bring additional beach resorts, boutique hotels and golf courses along the 100 mile coastline north to San Blas seems to have kicked into a higher gear. Stretches of the main highway have been completed, infrastructure construction is evident and direct access may now be limited to a number of primo beaches, particularly at El Monteon, Los Ayala, Punta Raza, Boca de Naranjo, Lima de Abajo, El Divisadero, and El Capomo. Although Punta Mita to San Blas can be driven in 3 plus hours, the peregrination took us 3 weeks. Travel throughout Nayarit over the years has taken us to many points, but none had provided such a diversity of interesting and in-depth immersions. It was an enterprising undertaking and an adventure traveler’s dream. Despite the changes, the region still abounds with authentic culture, brilliant sunsets, white sand beaches, resident and migratory wildlife, and unspoiled communities under a backdrop of the Sierra Madres with a history dating back to the Aztecs. Reflections of our three-week exploration between visits at the St. Regis are highlights of discovery- sensational hidden beaches, authentic villages, nature at its best, places to stay, dine and explore, and people at work and play. The annual Gourmet and Golf Classic is a culinary extravaganza featuring a star-studded lineup of international chefs and a two-day golf tournament. The evolution of this multi-faceted celebration has grown impressively since its inception in 2011. During this visit there were more participants, sponsors, cooking classes, wine and tequila tastings, a Lorena Ochoa golf clinic, a carnival themed cocktail party and festive beach banquet for 450 guests that included music, fireworks and a stellar painting performance. The all-inclusive destination sits on a long stretch of sandy Pacific Coast. An open-air top deck, railings and ventilation shafts replicating smokestacks add to the ocean liner atmosphere. The “deck” is abustle with people enjoying food and drink, swimming in pools, soaking in hot tubs, participating in yoga and dance classes and more. All 452 rooms and suites are below deck offering a panorama of the sea, sunsets and whales. Elevators and stairs take guests topside for food, fun and entertainment. Culinary options include all you can eat breakfast, lunch and dinner buffets and out-of-the-way à la carte gourmet restaurants. Navigating the undulating two-mile woods road off Highway 200 just north of San Poncho will deliver visitors to this sanctuary surrounded by a 300 acre ecological jungle reserve. We opted to arrive by way of an off-road jungle trail guided by locals. Roadside attractions included the Buddha, a meditation camp and an orchid farm. 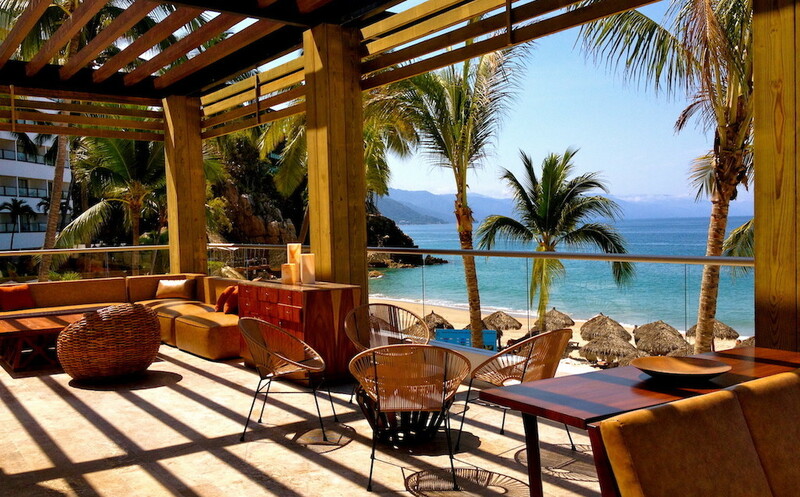 Punta Monterrey is a secluded, peaceful retreat on the beach. The setting, solitude, beauty and mellow staff insure a laid-back, soothing sojourn. The spectacular sunsets are a bonus. The 4 bungalows, 4 deluxe cabins and 4 rustic cabins are comfortable, spacious and air-conditioned. Each sits hillside amongst tall palms overlooking the sandy cove and ocean. Walkways take guests a short distance to beach chairs and umbrellas. Meals are enjoyed together at one long table optimal for a casual repast, buffet service, and friendly conversations. We relished a tasty dinner of sesame seed chicken cutlets with chipotle sauce, salad and cheese filled zucchini. A limited quantity of beer, wine and liquor are available. BYO is suggested. Guayabitos is a modest fishing village and resort considered a friendly, safe and family oriented beach town for travelers on a budget. It is favored by many from inland cities who flock to enjoy the beach, activities and frolic in Jaltemba Bay. It has also become a popular destination for American and Canadian winter vacationers and second home owners who appreciate its weather, warm water, miles of sandy shoreline and easy going nature. Many colorful, beach strolling vendors sell a variety of food, drink, ices and wares: tubes, kites, blankets, jewelry, etc. The traditional local shrimp-on-a-stick is a popular purchase. No wonder, it’s delicious, inexpensive and a plentiful resource harvested fresh from the bay. Coral and Crab Islands are two ecological reserves in the bay that are easily accessible by boat. The upscale Vista Guayabitos Restaurant located hillside at the southend of Jaltemba Bay presented an enjoyable culinary evening of al fresco dining. We savored a delicious cuisine of ceviche, dorado, tamarind shrimp and margaritas complemented by pleasant service, a lovely presentation and serenade. The striking panorama encompasses distant islands, the bay, and waterfront thatched-roof eateries along the expansive shoreline that stretches miles north to La Penita, a small town that hosts an expansive weekly, open-air market. It is where local farmers, artists and artisans sell fresh produce, fish, meats, prepared foods, Oaxaca rugs, tablecloths, wood carvings, Huichol art, jewelry and wares in the town square and along the streets. The seaside fishing village of Chacala is a destination frequented by international and Mexican travelers. The curve of the bay creates calm surf and safe swimming. Beachside palapa restaurants serve local dishes including freshly caught shrimp and fish. We observed many songbirds perched on wires, vultures and hawks soaring above, and coatis crossing the paved rural country road to the village,. Jose was instrumental in creating and developing a unique housing project with a group of community members. It incorporates visitors as investors in locally owned homes to create rental properties. The project increases the number of places to stay, supports household incomes, improves the resident’s quality of life and fosters interactions between visitors and locals. Canopied boats (pangas) are available for coastal explorations at the quaint Chacala Marina. Captain Freddy Jeel Martinez (327) 105-0133 piloted our boat skillfully while sharing much information about the waters, beaches, wildlife, lifestyles and jungles. We motored south to the picturesque cove dotted with underwater volcanic caves at Las Cuevas Beach in El Divisadero, and to Playa Boca de Naranjo at Lima de Abajo and El Capomo, a lovely 7-mile isolated beach that extends to La Penita. Many beaches south of Chacala were closed to public auto access by Fonatur and private developers. They can be reached by boat, although landing might prove difficult because of waves, wind and tides. Construction was underway at these locations with much activity visible at El Capomo, site of a new resort town. Twenty minutes north by boat from Chacala is La Caleta, a world class surfing favorite for top-level surfers only. Turtle Beach is a beautiful, secluded ten-mile stretch of sandy shore adjacent to a former coconut plantation. The northern end fronts a gated community of 16 spacious, contemporary, traditional Mexican and Mediterranean styled, architecturally designed beach homes offering modern conveniences. Many are available for rent with resort style amenities, services and a community pool. We stayed at Las Palmas, a lovely three-story home with roof top deck. Martha cared for the house and prepared tasty meals. The beach provides a solitary place for walking, running, horseback riding, surfing, boogie boarding and kayaking. The road from Rincon de Guayabitos and La Peñita to Playas Las Tortugas meanders on a paved highway through Las Varas, Zacualpan, San Isidro and Ixtapa. The traditional lifestyle is showcased in the towns, villages and roadside stands where fresh fruits, vegetables, drinks, cooked and baked goods are sold and fields of tobacco, papaya, mango, pineapple and other native crops are grown. The five-mile access road to Las Tortugas is a scenic ride surrounded by neatly cultivated working fields where a variety of birds are found in vegetation and on wires above. The scenic beach cove at Platanitos offers gently rolling waves, a calm swimming area and a lineup of palapa restaurants favored by Mexican nationals, many from Tepic. We sampled a few before discovering Vista Encantada that sits on a hill, just after turning off the highway and before the thatched-roofed options on the sandy beach. The recently renovated business maintains a swimming pool and thatched umbrella covered tables in a courtyard at cliff’s edge, overllokin the village, beach and bay. We savored a kilo of Robalo prepared zarendeado style, lathered in spices and Maggi juice and cooked over a mesquite open-fired grill by Chef Chona. The dish was flat out mouthwatering, melt-in-your-mouth delicious. We couldn’t get enough, and repeatedly returned to enjoy the setting friendly service and the delectable meal. The waters around Platanitos are known for Robalo, but most restaurants in town and elsewhere throughout our travels, regularly served fish zarendeado style with the more plentiful and available huachinango (pargo, red snapper). Chef Chano was able to special order Robalo (aka snook) from a local fishermen. This fishing village of 10,000 people was a treasured stop. It has changed little over time and maintained a friendly, small town feel. The port of San Blas dates back to the 15th century. In the late18th century it was one of the busiest ports, shipbuilding centers and most important shipyard on the Pacific coast of the Americas. There are a variety of things to experience in and around San Blas, a destination surrounded by nature. Birds abound and more flock to numerous prime habitats in the area during seasonal migration. They are attracted by an almost perfect combination of climate and environs of mangrove swamps, estuaries and lagoons. The location along the western flyway provides habitats and abundance of food for birds and wildlife. Nearby La Tovara National Park and the towns of Tecuitata, La Palma, Le Bajada, Paraje Del Ray, Singayata offer land and water trails for observing many species. The region hosts twenty beaches and a bounty of marine life including whales to watch and fish to catch. Matanchen Bay is known for its exceptional surf break and long rideable waves. Josefina at Garza Canela booked an afternoon boat excursion into this wildlife refuge adjacent to San Blas. La Tovara encompasses 1,600 acres of protected mangrove wetlands. It is home to the largest concentration of birds in Mexico. The best birdwatching is October-March. Peak is in January when 300 species inhabit the park. The preserve is a wonderland of water trails traversing through dense vegetation and almost impenetrable tangle of mangrove trees, some arching over waterways to create tunnels of verdant vegetation. Chencho took us on the Rio San Christobal and a mangrove waterway system that meanders for 60 miles throughout La Tovara to observe birds, turtles and crocodiles.It proved to be a most amazing, magical, mystery tour filled with an abundance of wildlife and much more. Although it was not peak season, we identified dozens of birds and were treated to a stunning sunset and scintillating, surreal day to night transmogrification. After dark Chencho shined a powerful spotlight to guide our intricate and lengthy route back to the dock. The luminous reflection from the ceiling of leaves bouncing off the water below made it difficult to determine which was up or down, in essence a psychedelic effect was created. When combined with the brilliant red/orange hues of the sky at sunset and the cacophony from rousted flocks of roosting herons it was at once a cosmic, transcendent and extraordinary immersion into nature. Chencho (aka Jose Inocencio Banuelos) was the ideal guide for us. We spoke different native languages but there were no communication problems. We shared a passion and understanding of birds and nature. As a professor of ornithology, I had led hundreds of birding trips worldwide while Chencho had done the same in La Tovara. Wonderful story. Enjoyed the photos. Will keep in our Mexico folder! Thanks for sharing.